Learn how to diagnose a problem thyroid yourself and fix the problem. According to the ATA Hypothryoidism Booklet, page 6, American Thyroid Association, 2003. "Thyroid hormones are essential and primary regulators of the body's metabolism. Imbalances can affect virtually every metabolic process in the body, exerting significant effects on mood and energy level. Thyroid function has a profound impact on overall health via its modulation of carbohydrate, protein, and fat metabolism, vitamin utilization, mitochondrial function, digestive process, muscle and nerve activity, blood flow, oxygen utilization, hormone secretion, sexual and reproductive health, and many other physiological parameters." That paragraph is significant because yeast infections are a symptom of a greater problem within the body and I see a lot of thyroid problems in women with yeast infections. Especially women that complain of their lack of energy and brain fog, which they attribute to candida yeast. Now if you have had your thyroid hormones recently checked you might be ok and could rule out these symptoms but then maybe not. The thyroid gland is composed of follicles that selectively absorb iodine as iodide ions from the blood to produce the thyroid hormones. Twenty five percent of all the bodies iodine resides in the thyroid gland. As the American Thyroid Association says, the thyroid must have iodine to function correctly. If it does not then you are going to have problems whether your T levels are in the so-called normal range or not. After all, how can they fit one set of hormone levels and call them normal for everyone? We are all different with slightly different physiology and different nutritional needs based upon genetic and metabolic type. Of course we all have the same basic nutritional needs but where one person may do well on a high protein high fat diet the next may not and instead require more good carbs to maintain good health. One person may do well with high T4 and T3 where another does better on the low end of the scale. Since the body is designed to function as a complete living organism made up of trillions of cells that work together with an innate intelligence to do what is best for itself. Wouldn't it be better to give it what it needs and let it do what it does best based upon its higher design? You have to look at where your thyroid levels are on your blood tests and you have to look at all of them. Not just the overall TSH or T7 levels but each individual hormone that the thyroid produces, which are T4, T3 and calcitonin. If you are on the low end you may have a problem. If additional tests from your doctor reveal possible autoimmune issues, known as Hashimoto's disease. You will more than likely need medication for the rest of your life. However, if you are a big wheat eater, you could try cutting all wheat from your diet and then retest in a month or two to see if the thyroid recovered on its own. Wheat contains a protein called gliadin that sometimes tricks the immune system into attacking the thyroid. If caught in time, the solution is to simply stop eating wheat. You can do a few simple tests at home to determine if your possible problem thyroid is working like it should be. The first is to take your temperature the first thing in the morning before you get out of bed. If the average temperature is below 97.8 for three days in a row, your thyroid is under active or you are iodine deficient. Now I have seen many women test at 98 degrees for a few days in a row and most people would consider themselves not to have a problem. However, and this is what I mean by the medical thyroid hormone tests being wrong as well, they still have a problem. Ok...lets get to the problem thyroid test. Get some liquid iodine from the store or pharmacy. Lugo's brand is best but whatever they have will do. Now paint a spot about the size of a half dollar on your stomach somewhere. If it disappears in less than 12 hours your thyroid is starving for iodine and is not working like it was designed. Its that simple! The thyroid must have iodine to function! Or, you can do this 24 Hour Urine test, which is extremely accurate and easy to do. The solution is equally just as simple, I would take Lugol's Iodine to support your thyroid. The thyroid will use what it needs and the body will dump the rest. 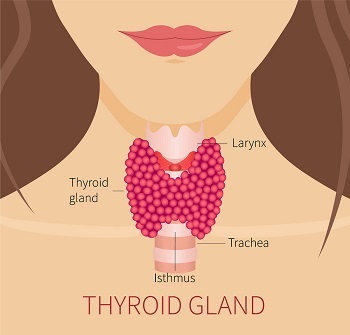 If you suffered from any of those symptoms above they will most certainly disappear as the body heals itself and the problem thyroid begins to work as it was designed for YOUR body. 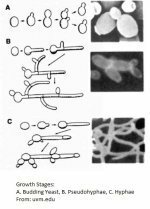 Have a problem thyroid and have any questions about yeast infections in general? Please feel free to contact me from the contact page of this website.